Frequent readers of the DOG Aviation Blog may have noticed there has been a long pause in the posts. Reason, I’ve been out of town receiving some great transition flight training in a factory built S-LSA RV-12. Since the acronym S-LSA has been brought up, as a side note for those non-aviation readers not familiar with the various versions of the RV-12, here is a quick rundown of the three ways the RV-12 can be certificated. When purchased as a preassembled, ready to fly, “factory built” RV-12, the RV-12 is certificated as an S-LSA (Special-Light Sport Aircraft) and certified by Van’s to meet a set of industry-developed "consensus standards" that specify design, testing, manufacturing, and quality control requirements. No changes can ever be made to the aircraft without approval by Van’s Aircraft the manufacturer… period. If the RV-12 is purchased in kit form from Van’s Aircraft and built EXACTLY per the plans using all the parts provided by Van’s along with making NO modifications or deviations from the plans during the construction, the RV-12 is certificated as an E-LSA (Experimental-Light Sport Aircraft). In a nut shell, the builder is being required to build a “carbon copy” clone of the Van’s Aircraft S-LSA RV-12. Interestingly, the manufacture’s name on the data plate will be listed as Van’s Aircraft … not the name of the builder who built the airplane. However, because the aircraft is now certificated as an experimental, changes can be made AFTER construction …. but only AFTER the required 5 hour phase one flight testing period has been completed. If a different engine or propeller is used or modifications have been made to the RV-12 during the construction process (as they have been on the DOG Aviation RV-12), the RV-12 can NOT be certificated as E-LSA because the RV-12 is no longer a “carbon copy” clone of the Van's factory S-LSA RV-12. In this case, the aircraft needs to be certificated as E-AB (Experimental-Amateur Built) which requires a higher standard of proof to be provided by the builder that at least 51% of the aircraft was built by the builder as a “recreational and educational experience”. Also, the phase one testing period is a minimum of 40 hours. Modifications can be made during and after construction and the data plate will show the manufacturer of the RV-12 aircraft being the name of the builder. 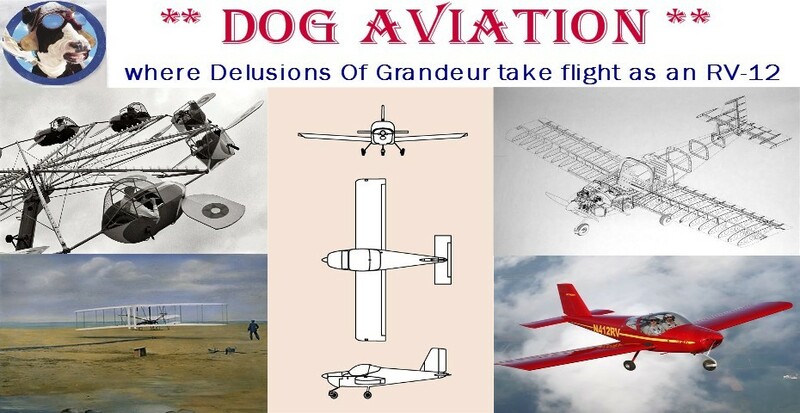 Getting back on topic, some may have been noticed that there has been no mention about taxing the DOG Aviation RV-12 around to conditioning the brakes, or heading out to the compass rose to calibrate the compass, ect. This is because while looking into getting an insurance policy to cover the about to be flying RV-12, it was brought to my attention that the day the aircraft could move under its own power, the builder’s insurance policy I had was null and void … I had incorrectly assumed it would stay in effect until there was an airworthiness certificate. Of course, that came as quite a shock to hear and left me with an uninsured aircraft and in a donut hole you will read about in the next paragraph. So fellow builders take note: If you are carrying a builders insurance policy for your airplane (as I was) and get the aircraft to the point it will move under its own power, you too may find yourself in the middle of a donut hole as I did … in that, the builder’s policy was terminated but the new aircraft insurance policy required that I have actual flight time in a RV-12 before coverage would be in effect. In my case, the insurance company stipulated I must receive at least 5 hours of training in an RV-12 with 10 full stop landings before coverage would begin … upping the ante, the insurance company also required the flight instructor have at least 750 hours of flight time, including at least 25 hours in the RV-12. The closest RV-12 in an area I felt comfortable flying in had experienced a bird strike on the leading edge of a wing so it was down for repairs for what was projected to be over a month. Another flight school I contacted had just recently received their RV-12, but none of the instructors had acquired the required 25 hours of flight time yet. So long story made short, opted to enlist the aid of Scanlon Aviation out in Novato California at Gnoss Field (KDVO) for my required transition training. Gnoss Field at Novato is located approximately 30 miles north of San Francisco just a few miles north of the beautiful San Pablo bay (which was very scenic one crystal clear day as we were watching the fog roll in and encapsulate the roadway of the Golden Gate Bridge leaving only the spires sticking through the fog). Scanlon Aviation at Gnoss Field (KDVO) in Novato California. 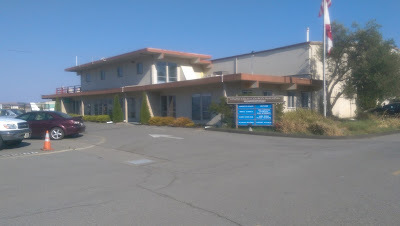 Scenically, the areas surrounding Gnoss field are truly diverse … there are mountains, large marshlands, the beautiful San Pablo bay to the south (a practice area) and seven miles to the north is the Petaluma airport where another practice area resides between Petaluma and the Pacific Ocean adjacent to scenic Point Reyes. Thirteen miles to the east is Napa … where the runways are long to support jet traffic and great for over the runway maneuvering practice. My flight instructor for the 10 day extravaganza was John Ward. Have to say, John knows the flight characteristics of the RV-12 like the back of his hand. Prior to each flight session John would discuss what the goal(s) would be for the flight session and how the RV-12 would react … John’s analysis was always spot on. I would not hesitate recommending John as an instructor for those builders desiring transition time in an RV-12 … he truly knows the flight characteristics of RV-12. The Scanlon Van’s Aircraft S-LSA RV-12. This was my chariot to the sky for 10 days. 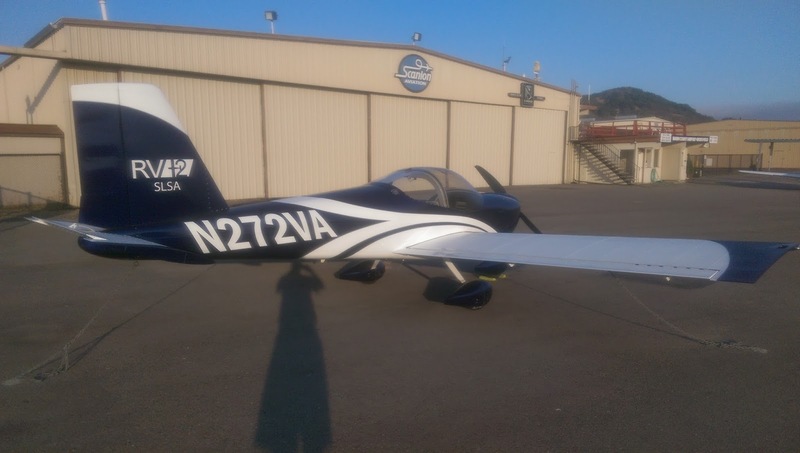 Because I’m returning after a many year lapse from flying, I wanted to amass more flight time in the RV-12 than just 5 hours to satisfy the insurance company’s requirements. After all, during the first flight of the DOG Aviation RV-12, I will be a test pilot of sorts … a task which is not to be taken lightly. With that in mind and wanting to really feel comfortable with the RV-12, a total of over 18 hours of flight time was logged in Scanlon’s RV-12 and 79 landings … some days included having both a morning and afternoon flying session. During the first scheduled flying session, the winds were ripping straight across the runway meaning no flying that day … so John spent time reviewing the flight characteristics of the RV-12, my flying background and what my expectations were. Because getting accustomed to the RV-12’s differential braking for steerage takes a little getting used to, John suggested even though the winds were too stiff of a direct crosswind for a first flight, I could gain some valuable experience taxing the RV-12 around Gnoss Field in the stiff wind to get acquainted with controlling the RV-12 on the ground. So that is what we did for about a half hour so I could get used to controlling the RV-12’s full castering nose wheel using the rudder and differential braking. The taxi session also included a few very fast passes down the runway so I could get experience controlling the airplane on the runway with a stiff crosswind wind. Admittedly, steering the RV-12 with a stiff crosswind is a little tricky at first but the task is easily mastered with a little practice. The winds during second day were calm and we were able to go flying. First impressions … the RV-12 simply flies great! When trimmed to hold an airspeed, only fingertip pressure is needed to move the airplane around. Pitch and roll are light but well harmonized. Because the flaperons run practically the full length of the wing, they are powerful so not much control input is required to generate a turn or roll of the wing. Please don’t read twitchy into what I described, because it is not … rather, just a little pressure is needed to set a bank angle and a death grip on the stick is not necessary. The pitch or stabilator control is also nicely balanced and if the aircraft is trimmed properly for any given speed, it only requires small stick movements to move the nose up or down … here again light forces but not twitchy, the stabilator offers super pitch control over the runway. The RV-12 is an airplane you can finesse with your fingertips. Getting the feel for the rudder while over the runway is where I had my biggest issue, which I attribute to a combination of things. One, being rusty as I’ve been out of the game for a long time and needed to correlate what the eye sees to a foot action, Two, I was initially using a wrong sight picture while over the runway … one that would result in a little yaw. Three, my tennis shoes were dragging on the carpet as opposed to rocking so as I felt I had pressed down on the rudder pedal it was not enough actual rudder pressure to create the desired rudder movement necessary to prevent a yaw from developing while a few feet off the runway. And lastly, apparently subconsciously I was also apprehensive about making relatively large rudder control movements just a few feet off the runway. All of the above kept me stuck in a dead right foot rut for far longer than I want to admit. But eventually it all got sorted out and admittedly John had the patience of a saint and developed a few over the runway exercises for me that brought it all home … literally overnight. Although the RV-12 only requires small control movements for pitch and roll, the same cannot be said about the rudder … I’m guessing it needs to be moved at least 35% more than the stick, so a stick roll deflection of ½” will need an opposite rudder deflection of almost ¾” to hold the centerline of the runway. The takeaway from this is the RV-12 will run out of rudder control FAR sooner than it will run out of aileron (flaperon) roll control. To quote an often heard phrase from John now engrained in my brain …. “Push The Rudder”. To help me get past my rudder issue, I used a different sight picture more in line with me and not the nose of the airplane along with positioning my feet on the rudder pedals differently. John gave me a series of low altitude exercises to perform over the runway to help bring it all together. John took control of the throttle on short final had me flying down the long Napa runway a foot or two off the deck holding centerline and then played with the power settings so the airplane would move around and require a quick correction to hold the centerline with no yaw …all while staying slightly off the deck the full length of the runway. The same exercise was also varied by holding the RV-12 off the runway a foot or two and then drifting to the left then back to the right possibly touching tires in the slip with no yaw, all the while the power settings were being changed by John to keep me on the ball and forcing the use of my feet to control unwanted yaw components. It was a superb, well needed practice to be sure and it finally got everything clicking for me while close to the runway. Wow! The RV-12 is very nimble over the runway and very easily controlled once you get your feet working correctly on the rudder pedals. One entire afternoon was spent exploring all the various stall characteristics of the RV-12 which I can say, for the most part, were predictable and straight forward. We explored every conceivable stall with and without flaps using various power settings ... straight stalls to steeply banked stalling turns in both directions … by in large, the RV-12 talks to you prior to the stall. We also explored more aggressive banked skidding stalls and cross controlled stalls (those are attention getters as the stall develops rapidly) for the most part we did every type of stall shy of getting into aerobatics. While at Napa Labor Day, there was quite a bit of jet traffic (guessing from the rich and famous hitting the wineries for the Holiday) so it made for a good wake turbulence avoidance review and training. John also threw a bunch of scenarios at me such unusual situations … emergency landings, landing without the flaps as if they were broken (a non-event), dealing with a runaway trim, high approaches requiring rudder to the stop, full forward slips to the runway (as a side note the RV-12 slips beautifully), engine failures on downwind approach, landing with a total “lights out” with the Garmin flight display turned off … requiring get ‘er down by the seat of your pants. The only downside for me was the avionics package in the Scanlon RV-12 is a Garmin G3X and not a Dynon SkyView … so I could not delve into programming flight plans, setting up GPS waypoints, autopilot settings, etc., since all that will be different for the Dynon SkyView. Will just need to sit in the cockpit and crack the SkyView manuals and become acquainted. Also need to view a few of the available YouTube videos covering usage of the SkyView. Many thanks to the crew at Scanlon Aviation and, in particular, John Ward for waking up my feet, offering useful inflight tips and getting me up to speed in the RV-12. For fellow builders seeking RV-12 transition training, I can wholeheartedly recommend the services at Scanlon Aviation and, in particular, instruction from John Ward.